We’ve reached part five of six of the Venom Inc. crossover, and I’m still left wishing this story would take things just a little bit farther to give us fans what we were hoping for when this was announced. A few weeks ago, Ryan Stegman posted a preview of the alpha issue on Twitter, showing the Venom symbiote literally torn between bonding with Eddie Brock and Flash Thompson. Cool! This is exactly what we wanted: the confrontation between the two who feel they are most deserving of the power of Venom. Unfortunately, that’s never what Venom Inc. was meant to be about, so that confrontation was anticlimactic. What we’ve gotten instead is a decently entertaining run-of-the-mill fumble between protagonists that, sadly, doesn’t look like it will have any lasting effects on those who actually have their own book. 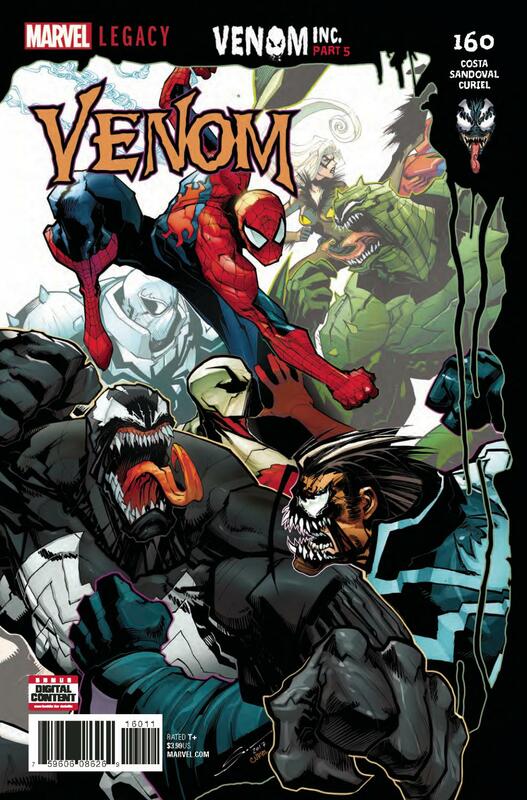 So… Can we have a Flash Thompson: Agent Anti-Venom ongoing now? As I said, this story is actually about these spider/symbiote centric heroes working together, rather than confronting one another. With the rest of the team outside, Spider-Man is undercover as one of Maniac’s Made Men, but quickly breaks the illusion… by making a joke? There’s no real reason as to why this gave it away. He was cracking jokes when he and Price spoke in Amazing Spider-Man #793. What was different about it this time? Nothing, as far as I can tell. Writers Dan Slott and (more accurately) Mike Costa wanted Spider-Man to blow his cover without a good way to get there. Anyway, a fight breaks out in which Flash reminds us yet again that it’s good to be back, just in case we forgot that he was out of the superhero game for a minute. Then, Eddie makes a familiar claim that Maniac’s symbiote is a disease, and he has the cure. A) I feel like I’ve heard this once every issue. Flash definitely said some variation of it in the last one. It’s getting old. Speaking of which, for someone who was very dedicated to reuniting with his symbiote partner, he seems to have forgotten about Venom and completely embraced his new identity very quickly. B) Having Eddie, who used to be Anti-Venom and loathed symbiotes himself, state that he’s the cure to a symbiote’s disease while happily bonded to one… It’s just confusing. It makes it that much more frustrating that we still don’t have an explanation as to why Eddie suddenly wanted to be Venom again. Then Costa tries to convince us that Brock is the superior Venom because Thompson lacks imagination. Sorry, I don't buy it. I don’t want it to sound like I didn’t enjoy this issue. These are just things that stuck out to me and I thought were worth mentioning. There’s more good than bad here. It’s great that Venom is finally being given more to do. He’s felt strangely absent for much of this crossover which happens to be named after him. And Spider-Man saving him from raining anti-Venom was a welcome surprise, considering how straight up mean he’s been to him since the alpha issue. Now, it’s no secret that I’ve had mixed feelings when it comes to Gerardo Sandoval’s art. While I think the guy draws Venom and anything that could be described as a monster very well (this is why the Land Before Crime was a visual highlight for me), I really am not a fan of how he draws most everything else. However, this issue felt like a noticeable step up. I especially love Black Cat in the bottom of the first page. I don’t think I’ve ever seen Sandoval present someone looking this real. Normally, his faces look very angular and blocky, but here, they feel much smoother. Some interesting perspective choices give a powerful sense of depth to what you see. I also just noticed that Maniac’s symbiote constantly shows its teeth, but behind them is Lee Price’s mouth. It’s more like an actual mask, which plays into the relatively new idea that symbiotes aren’t inherently evil. Rather, the person bonded to it can use the symbiote like a tool for their own desires, good or bad. It’s a smart and unique touch on the design of the character that upholds the notion very well.